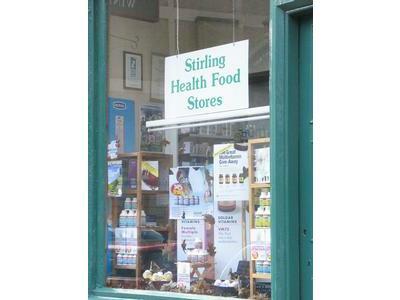 Independent Health Food Shop in Stirling selling health foods, whole & dietary foods, minerals & vitamins, herbal supplements, homeopathic remedies, non-chemical toiletries and homebrew beer and wine making supplies throughout Scotland. Established in 1976 in Stirling, Scotland, the Stirling Health Food Store has more than 30 years of experience in the natural and health food sector. They believe in being independent, supporting the local community and minimising environmental impact. They sell ethical, organic, chemical free, natural, fairtrade, local, dietary foods and products. A wide selection of healthy whole and dietary foods for people on special diets or special needs like: gluten free, diary free, wheat free, vegan or vegetarian food and products. A huge range of homeopathic supplements and herbal remedies, including vitamins and minerals of top brands, like A.Vogel, Solgar, Viridian, Lifeplan and Nature's aid. A wide range of bio-degradable and chemical reduced toiletries and household products like aluminium free deodorants and bleach-free women's sanitary products. A wide selection of top quality homebrew kits, supplies and self-sufficiency products, like: beer making kits, wine making kits, demi-johns, 20L and 5L buckets, corks etc. If the product or the brand you're looking for is not listed on their website, they might be able to order it for you.